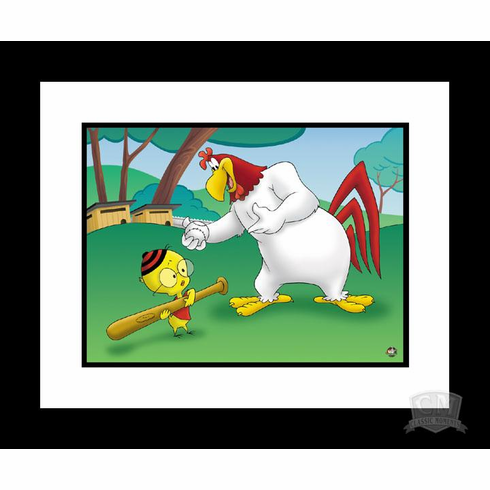 This framed limited edition 16" x 20" giclee is entitled �Let's Play Ball.� Released in 1954, under the direction of Robert McKimson, �Let�s Play Ball� captures a classic scene taken as an actual �freeze-frame� from the film, Little Boy Boo. This film is one of several in the Foghorn Leghorn series utilizing the theme of loud-mouthed rooster, Foghorn Leghorn attempting to woo the widowed Miss Prissy by baby-sitting her super-intelligent son, Egghead Jr. Edition Size 500. Gicl�e, as a fine art term, has come to be associated with prints using fade-resistant "archival" inks (including solvent inks) and the high-end inkjet printers that use them.